Crystal's Crafty Creations: Little 4th Birdie! Good Afternoon, well I am a little disappointed on how this card came out. I bought this little hat from Amuse and new I could put it on all kinds of animals I had. I decided to go with my little birdie from imaginise. I really loved how my image came out but the rest well...I don't know, I fussed with this ribbon treatment and the dp I used gave me a hard time too. So after too much fussing I decided well this is it. I used the sketch for Mojo Monday! Great sketch..... Here it is!! Go check out the blog it is really fun! Thanks for stopping by today!! Hi Crystal, Your little blue bird is super cute!! Took a look at your other cards too, very pretty. I like your style! I love this card. The little bird is super and the DP is great too. I love the red white & blue. I think your card came out adorable!! I LOVE that patriotic hat!! How cute! I love the little birdie! I had some trouble with my Mojo ribbon, too... I ended cup cutting it and sticking it down with sticky taoe t make it lay the way I wanted it to! Hey and congrats on all of your followers! you almost have 100! Hi Crystal this is one very cute card and it all looks gorgeousto me. oh, how cute is this guy!!! Awesome! I think your bird and the rest of the card looks perfect!! You did a great job with the sketch and the whole look of your card. So cute!! Love your card!!! The bird is so cute with the hat. Love the DP. Sometimes we can be our own worst critics. So cute!! Clever idea to put the hat on him! Oh,so cute! I love all the fanfare! Crystal I think it came out great!!! I love the hat on this birdie! I'm working on this sketch too... the ribbon is a tough one! But your card came out great!!! I love your birdie Crystal!! So sweet!! Great colors!! Gorgeous card! We are always our own worst critics! Crystal, this turned out sooo cute!!! 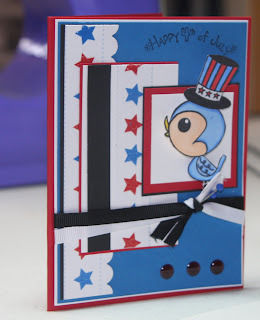 I just love the little bird with the hat and all the red/white/blue papers...such a wonderful patriotic card!!! I love that jaunty had on birdie Crystal! and the stars Dp and stitching - fun Patriotic sketch card! Sooo cute. I have this little bird. it is so cute. Love the red, white, and blue. what a fun card! I love the patriotic theme! Fun colors and brads. Way to rock the mojo sketch this week.